I was so pleased with the way that the first ‘wearable toile’ dress turned out that I immediately set about making another version. For this version I used some Pink floral patterned polyester jersey that I purchased from Fabricland, Salisbury back in April 2018. As mentioned in the previous post, I was unhappy with the construction method for applying the neck binding and also the fact that the twist pulled up the bodice seam and skirt hemline at centre front. To resolve these problems I made a Full Bust Adjustment to the bodice by dropping the point of the centre bust bodice seamline by 2 inches. I used the Nancy Zieman method of pin and pivot which means that the length of the seam remained the same whilst still providing that extra room for my bust but without distorting the seamline. Whilst cutting the skirt panels I added about 1 inch to the length – just to provide a little extra coverage for my knees. For the binding of the neckline I changed the construction method slightly. I cut the binding as per the pattern but this time stitched together at the short ends. I made the seam the centre back point and added notches to mark centre front and quarters between CF and CB. Having completed the twist I then stitched the centre front bodice seam and also above the twist as far as I could. I marked the neckline on the bodice in the same way as the binding before attaching right side to right side. The binding was turned to the inside and stitched with a narrow zig-zag in place. The final result is good and bad. Good in that the neck binding is a complete finish with no bulky turnings at the front which I had encountered on the first version. Bad in that there is a definite ‘gap’ above the twist and below the neckline binding. I don’t mind it but feel sure there must be an even better way to manage the twist and the neckline. For the next version I plan to make a front bodice lining which I hope will resolve these outstanding issues. I did write out a crib sheet for the construction method but in the end did not follow it as having made the dress once before I was confident to go straight ahead and sew! This pattern has a 5/8 th inch seam allowance and as I was confident of the fit I stitched mostly on the overlocker. 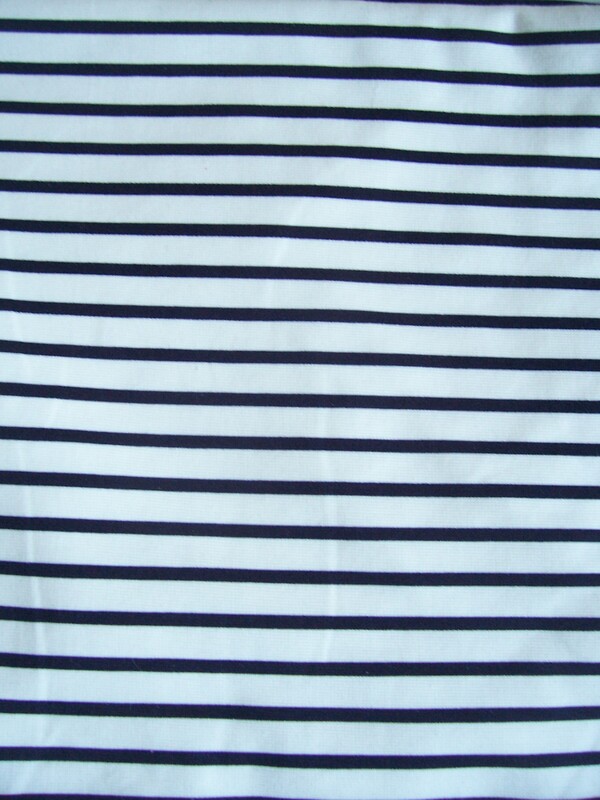 I repeated the hem of the short sleeves by turning back and overlocking so that the result looks like a hemband. The hem of the skirt has been left unfinished. This fabric does not fray and I did not want to run the risk of a ‘lumpy bumpy’ hem by stitching with either a narrow zig-zag or a twin needle (plus of course, I wanted to wear the dress a.s.a.p!). Now that I have ‘nailed’ this dress I want to try a hack into a top at the same time using the lined front bodice method plus the fluted sleeves. Now where did I put that fine jersey that I think will be ideal for this project? I purchased my copy of Tilly’s latest book ‘Stretch’ as soon as it was released and have been waiting impatiently for a ‘window’ to be able to stitch the Joni dress. For this ‘wearable toile’ I chose a pretty floral print viscose jersey bought from Fabricland (in December 2017) for £4.44 per metre. The dress takes 2.5 metres of 150cms wide fabric. 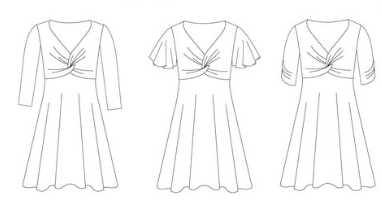 I traced off the pattern (size 8 in Tilly sizes! ), adjusted slightly for my rubenesque figure then set to and quickly made the dress. The book contains many pages of instructions with photographs but I found them a little confusing as they go off on a tangent to describe the various techniques. I intend to re-visit and type up my own ‘crib’ sheet which will be much more succinct. Additionally I did not find the instructions for the finishing of the area around the twist very clear, I ended up neatening the area and stitching the undersides of the twist together. The neck binding was, I believe, more complicated that it needed to be and I will investigate alternative methods for finishing the neckline. I attached clear elastic as instructed by basting with a long straight stitch on the sewing machine. When it came to overlocking the pieces together, due to the 5/8ths inch seam allowance, the elastic was cut off. This does not appear to have had a detrimental affect on the dress. In future I may well omit the elastic on the bottom of the bodice and will use my TNT method of fine ribbon to stabilise the shoulders. The elbow length sleeves hit just into the crease of my elbow which is uncomfortable. I folded back 1 ½ inches before overlocking so that the hem now looks like a sleeve hem band. I like that effect. 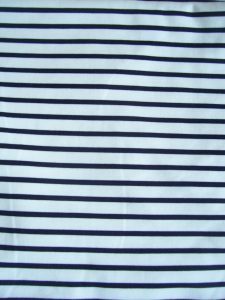 The hem of the skirt was stitched with twin needles. I had failed to notice in the description that the pattern is drafted for a dipped hem. On me it looked as though too much fabric had been taken up by my bust. I have re-drafted the bodice front pattern and made an FBA (full bust adjustment) which means that the bodice seam and front hemline will now be parallel to the floor. 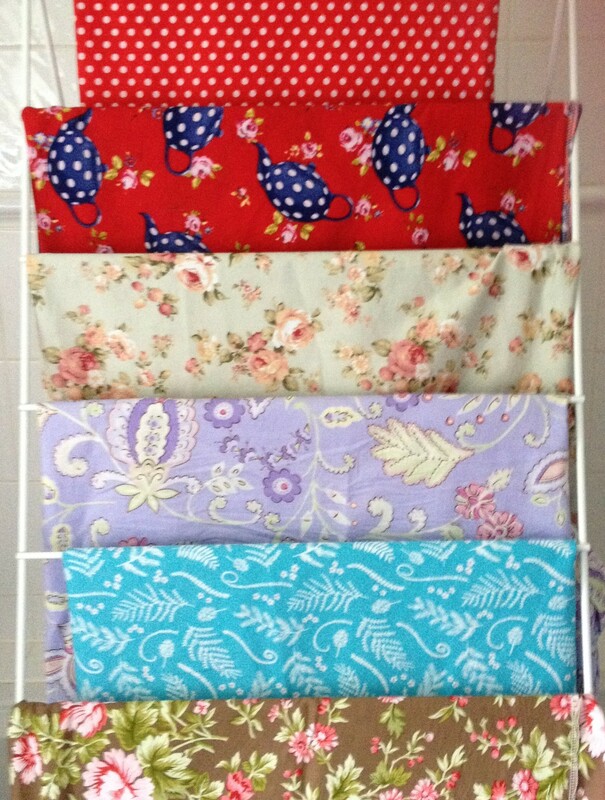 You may have noticed that I have been rather self-indulgent recently with all my fabric purchases! 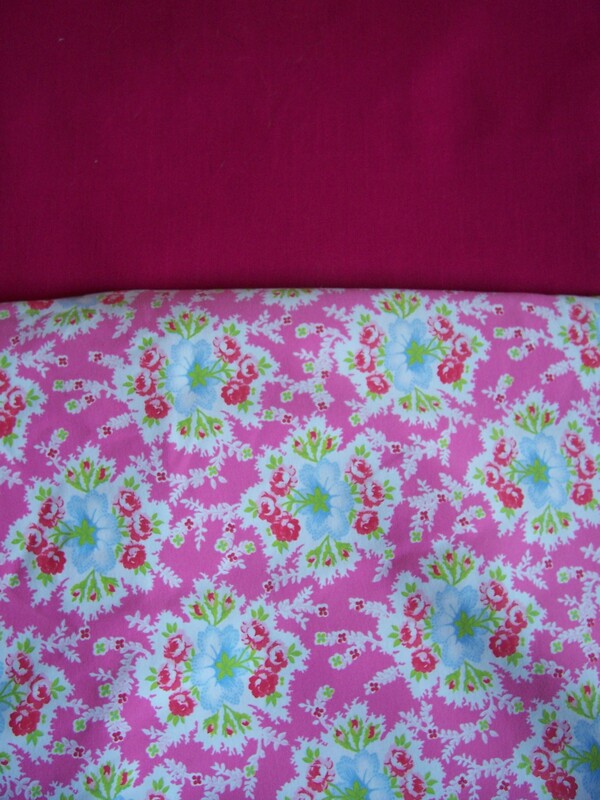 To redress the balance slightly, I decided to use fabric from my stash to make a new dress. This delightful Lobster print cotton has been loitering in the stash for at least a year, probably two. Whilst I was washing some of the latest fabric purchases that are in a Red colourway, I included this 3 metre length so it was now ready to ‘Sew&Go’. 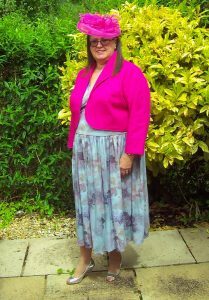 I used my TNT bodice block with scoop neckline, self-lined cap sleeves and added a 2xwidth of fabric gathered skirt. No problems with construction – all my usual methods and techniques were applied. They included a lapped zip set in the centre back seam approximately 3 inches down from the neckline. There is roughly 2 inches of ease at the waistline and this seems to be the optimum amount. I will make a note of this for when I prepare the Vogue 8577 pattern. The skirt panels were cut 29 inches long, the finished hem is at 26 inches. 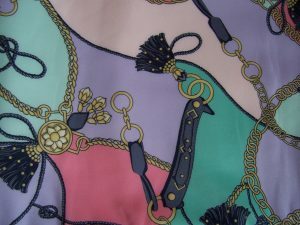 There are the usual pocket bags set into the side seams, the top of the pockets are stitched into the waistline. In my haste to get the dress cut out and sewn, I forgot all about pattern matching. Also unfortunately, somehow along the way the width of the shoulder seam, especially on the front bodice, has been reduced and this has affected how the self-lined sleeves are set. 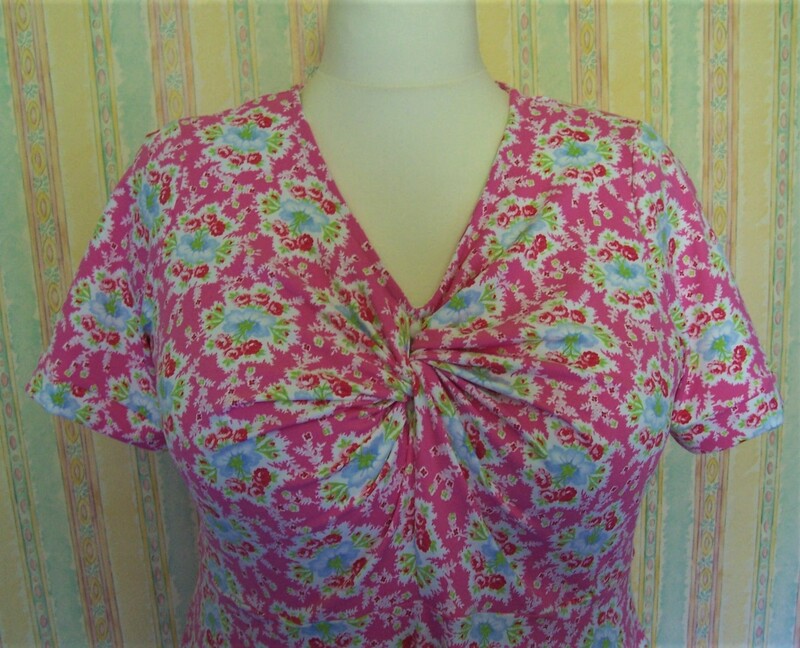 In addition, I need to re-draft the back neckline as that does not sit quite right. I shall still wear the dress but it will never be a favourite. It is possible that at some time in the future I will remove the sleeves and make the dress sleeveless. Oops! What part of a fabric buying ban did I not understand? Having recently spent my budget on a gift for my husband to celebrate our wedding anniversary, there was supposed to be a fabric buying ban in force until the Festival of Quilts in August. Somehow I seem to have misunderstood. 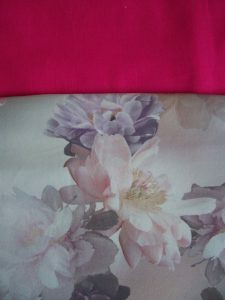 I purchased some pretty cottons in Franklins, Salisbury on Monday last week and then this week I visited Fabricland for some more that I simply had to have! The Red with White polka dots is to be made up into a shirtdress – pattern tba. The Beige floral will be my TNT bodice with a full gathered skirt (inspired by a dress seen in a shop window in Salisbury). The Lilac floral has been made into a Teddy Designer Tunic by Style Arc – details already posted. 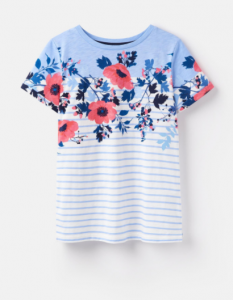 The Turquoise fern print could possibly be a Vogue 8577. 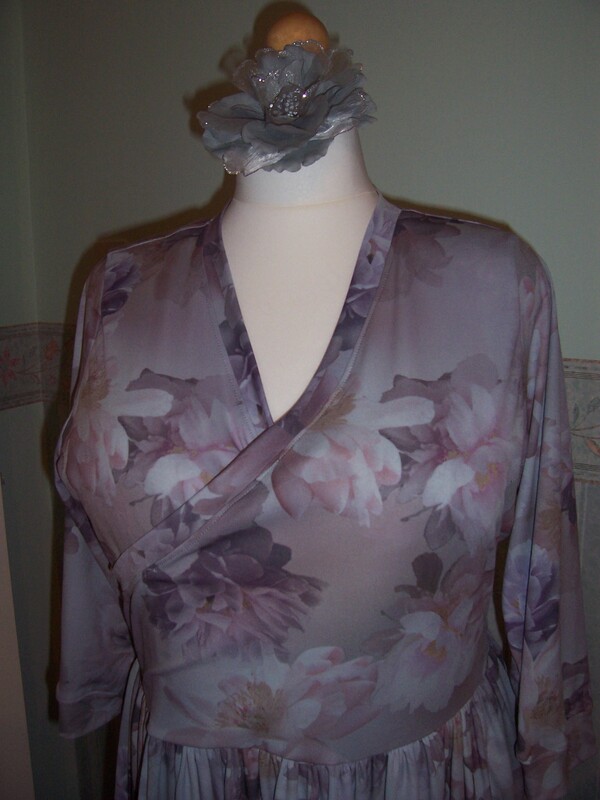 The Brown background floral will possibly be another Teddy Tunic – getting ready for the Autumn already! Not shown in the picture is a length of Classic Blue denim that I ‘needed’ to make the Pippi Pinafore Dress by Jennifer Lauren. 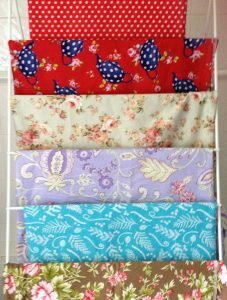 All fabrics have now been laundered and are ready to ‘sew&go’ so watch this space for some new garments! 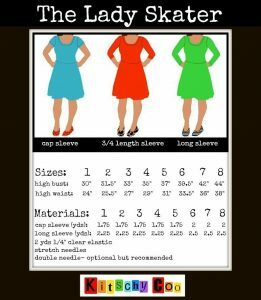 After some careful consideration I decided that the short self-lined sleeves would be the best way forward to completing the dress. With the vagaries of the British Summer weather and because I don’t always want to have to wear a cardigan, short sleeves are ideal for wearing in the UK. TNT bodice, used the full 5/8 ths inch seam allowance on the side seams. Raised the waistline by ½ inch at centre front. 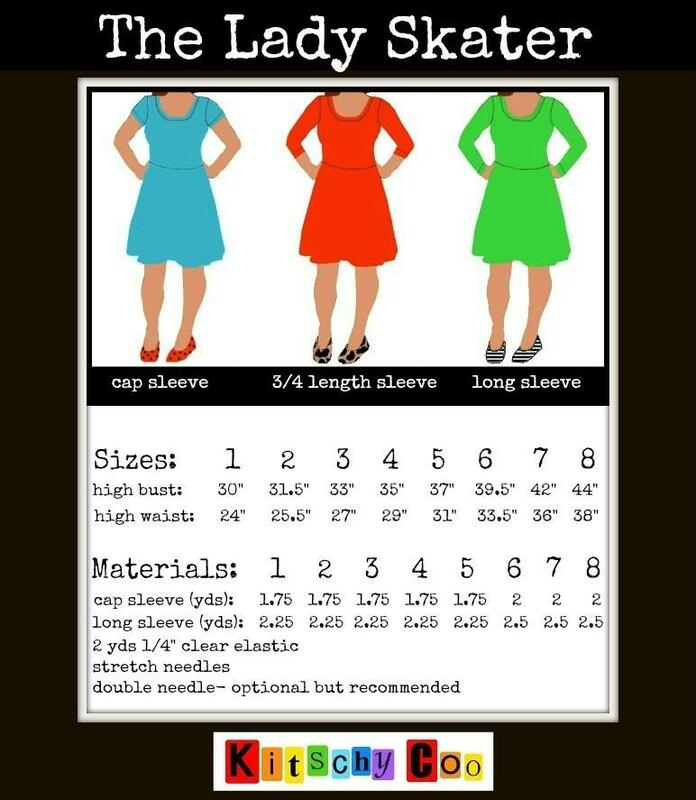 Self-lined sleeves. Light fusible interfacing used on the neckline facings. Understitching completed using a 3-step zig-zag stitch. Lapped zip in centre back seam, set 3 inches down from neckline. Hand picked final seam of the zip insertion. Extended back neck facing with printed ‘Carousel’ label. Full circle skirt using ‘Betty’ pattern by Sew Over It. Side seam pockets stitched into waist seam to prevent ‘flapping’ about. All seams neatened by overlocking. Machined narrow hem on skirt. I am particularly pleased with the way that the pattern has matched on the centre back seam although this is purely accidental. 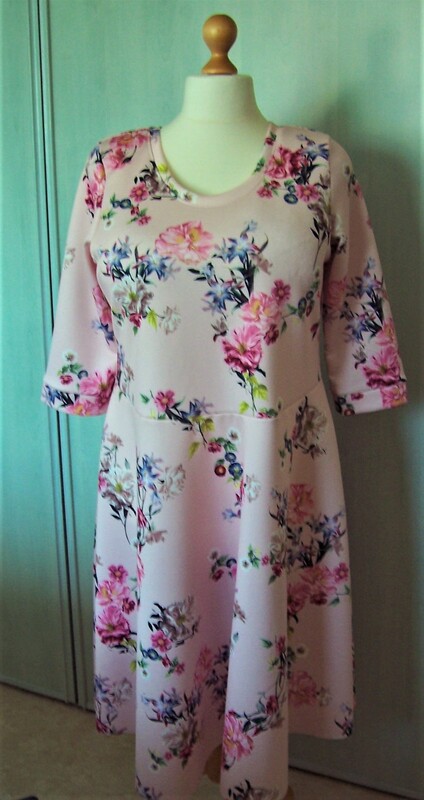 The dress has turned out very well, I am delighted with it and definitely plan to make another in this style. Depending on the occasion, I may even get to wear the dress with my Red can-can petticoat! Over the weekend my husband and I will be celebrating our 40th (RUBY) wedding anniversary. On browsing through some of the photographs from our honeymoon I see that I sometimes wore a Red cotton floral print dress. Inspiration then to make another to wear on the anniversary…. 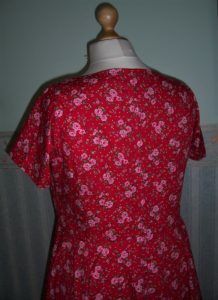 I will use my TNT bodice pattern with the cap self-lined sleeves and centre back zip fastening. I will add the circle skirt from ‘Betty’dress by Sew Over It to make my favourite dress style. Construction was very straightforward. After about 3 hours I had an almost-completed dress. Now – a decision to be made. Do I make the dress sleeveless or should I insert the sleeves that are made up and ready for insertion? Hmmm, I will leave the dress on the mannequin overnight and decide in the morning. It has been over a week now since I attended the wedding of my husband’s eldest grandson, Michael to his fiancée Lisa. Since then I have attended a Sewing Retreat day and a Patchwork & Quilting class. It was only today I realised I had not posted a picture of the final outfit that I wore for the wedding. As you will see from the above photo, the wedding ceremony was held out of doors in a Bluebell Wood. Very romantic! To get to the location involved a walk up a hill via a couple of fields and a wood. I therefore changed from my Silver stiletto shoes into ‘much more appropriate’ Cerise pink loafers. 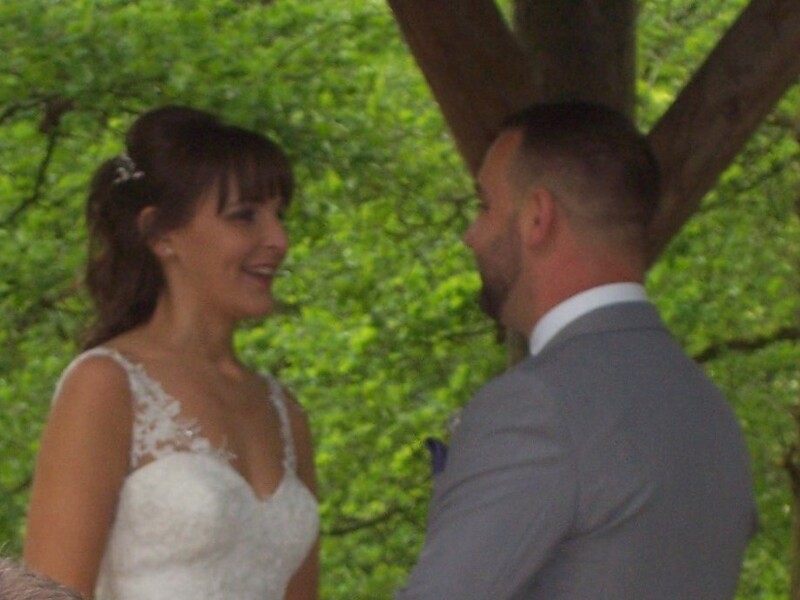 The day was lovely and Mike and Lisa make a charming couple. 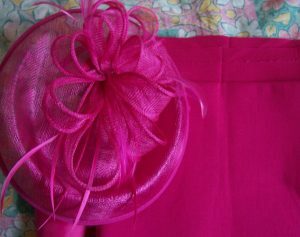 I shall be wearing my dress and jacket ensemble again in the future but do not foresee many outings for the fascinator! Bearing in mind the vagaries of the Great British weather – I thought it advisable to have a second dress available, to wear in case the temperature drops. 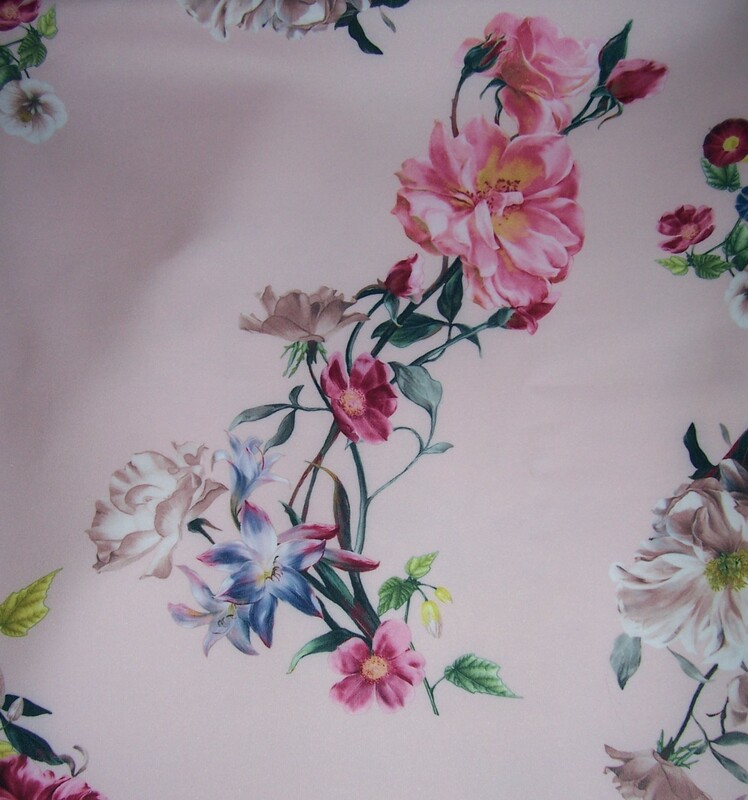 Scuba fabric tends to be warm so I decided to use the 3 metres of attractive floral print that I bought from Fabric Styles at a total cost of £19.50. As the previous iteration of the Lady Skater dress made in Snake print Ponte Roma worked so well I decided to use that pattern again. However, a different fabric with different qualities, produced a very different result. At fitting I discovered that the bodice was much too long in front, the shoulders still too wide and the entire bodice too big overall. I made some adjustments and now the dress fits just fine. 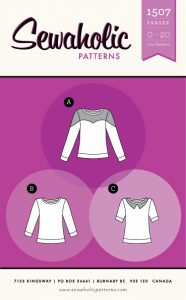 I used my TNT method for adding the neckband and again added double thickness 1 inch wide cuffs to the ¾ length sleeves. I am undecided on how to treat the hem of the circle skirt. Being a Scuba I could just leave it but that is a little ‘bohemian’ for my taste. I shall probably twin needle hem stitch when I have finished the Fraser top that I am currently working on. I am also rather ambivalent about the finished dress, I don’t feel 100% comfortable with the design/fabric print combination. But hey, it is a new dress and I am sure that it will ‘grow’ on me. 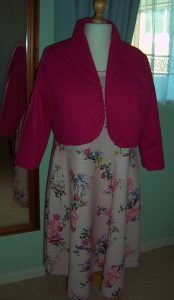 In the meantime it does look good on the mannequin, paired with the Cerise linen jacket. Well, after yet more procrastination, here is the finished dress made up in the fabric choice of the Friday P&Q Sewing House Group. 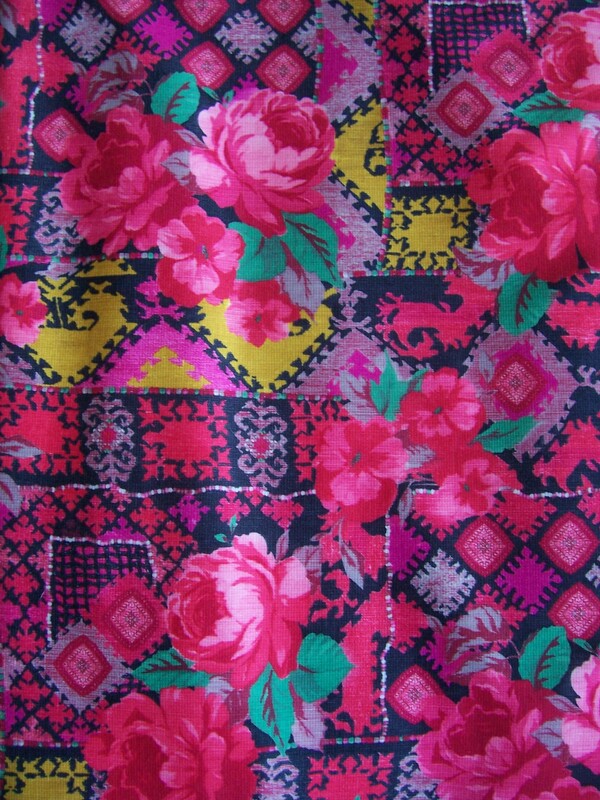 Listed as Stretch Poly/Viscose, I bought 3 metres from CheapestFabricsUK eBay shop at just £4.95 per metre (sadly now out of stock) and used my TNT hack of the Dartmouth top by Cashmerette. This fabric is really fine and drapes beautifully, but is not for those new to stitching jersey fabrics. It slips and slides and is like trying to wrestle mercury! However, I persisted and have to say that I am now very pleased that I did as the dress is so comfortable to wear and looks really ‘classy’. Most of the stitching was done on the overlocker but there are a few places where I have top-stitched by machine, partly to control the fabric! The gathered skirt was made using two panels cut 29 inches long by the full width of the fabric, so approximately 120 inches of skirt width. Two rows of gathering stitches plus clear elastic helped to control the fabric and ensure even gathers. 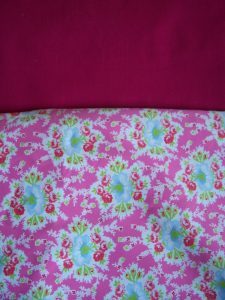 For the hem, I plan to machine using a twin-needle but at the time of photographing the outfit, I did not have access to my machine (cat asleep on sewing chair!). Every time that I make up the Dartmouth top, I have used a different jersey fabric. Each and every one has performed differently. On this iteration the crossover of the wrap has come out a little low, I may have to invest in a light lace-trimmed camisole to wear underneath. 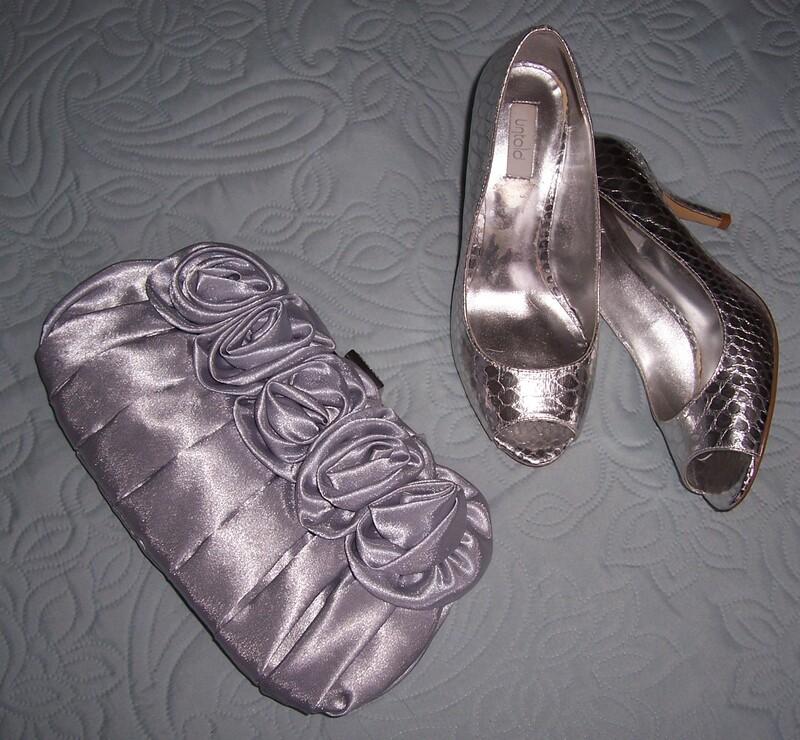 Other accessories are a Silver Grey satin clutch bag trimmed with fabric roses and some Silver ‘crocodile’ textured peep-toe shoes. 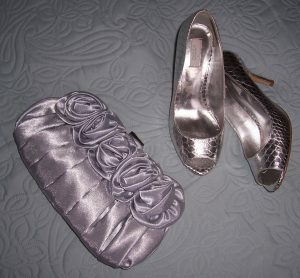 I will also have a pair of Silver-coloured mules to change into when the need arises! 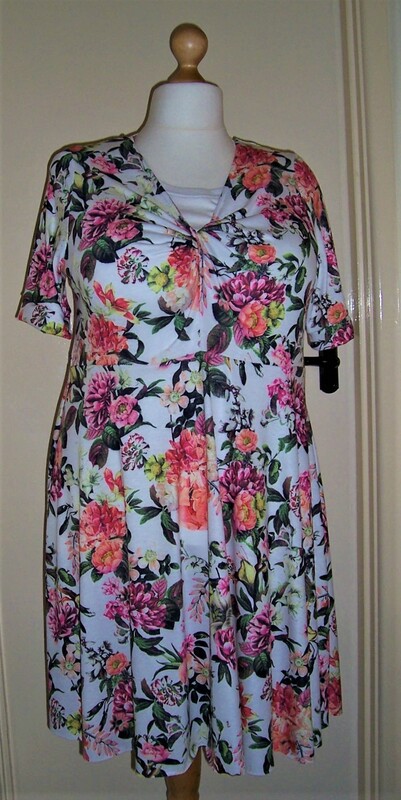 Now that I am well and truly back home and the weather has improved so that we are enjoying a very late Spring, I have to make my sewing plans. I have been delayed from my first love of dressmaking as I insisted on completing the quilt top in memory of my Caribbean cruise. But now that is done, it is back to dressmaking. Planning. I have lost weight since last Summer so several of the makes no longer fit. 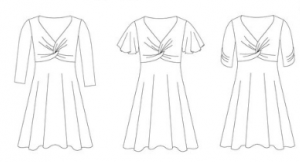 I hate making alterations – I would much rather make an entirely new garment. 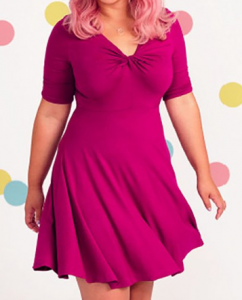 I have sold a few of last year’s dresses and have plenty of ideas, patterns and fabrics to make new ones – but which ones? Prioritising. I have a family wedding to attend in just three week’s time – I cannot wear the same dress as last year’s wedding for two reasons a) it no longer fits(!) and b) the wedding will be attended by the same family members. I have a certain reputation to maintain – if I attended the wedding wearing the same dress, rumours would start that I was feeling unwell! As my readers will have concluded, I enjoy wearing bright and colourful clothing. So, for this wedding my colour choice is Cerise Pink. I have the fascinator and will make a little jacket in the same colour. Purchasing. The fascinator hat was purchased new from The British Heart Foundation charity shop in Winchester. 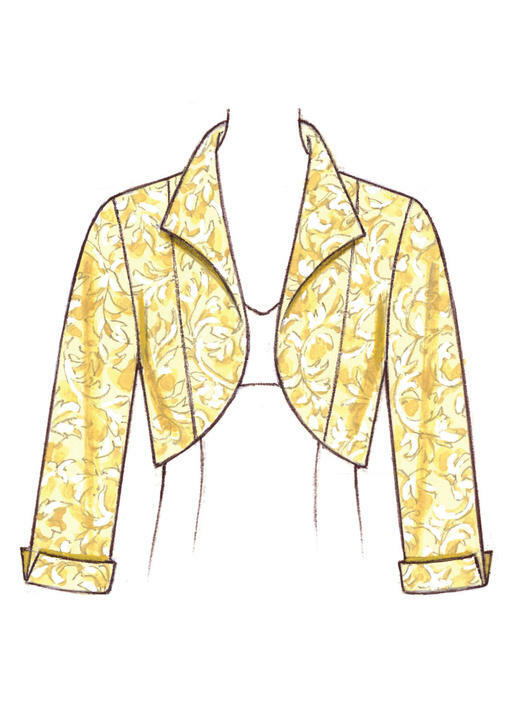 The linen-look fabric for the jacket was bought from Fabricland in Salisbury. 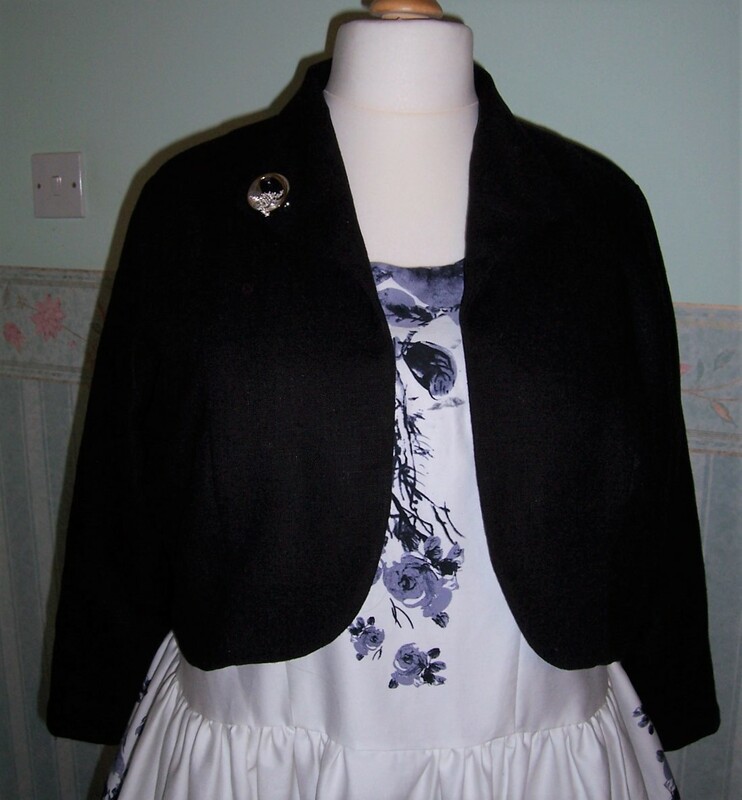 I plan to make another version of my ‘hacked’ jacket from KwikSew 3736.
the fabric choice for the dress is almost limitless. Procrastination. I have been buying lots of jersey fabric. Whilst at Fabricland I fell in love with this ponte roma that coordinates very well with the Cerise ‘linen’ for the jacket but the ladies of the sewing house group deemed that it was not sophisticated enough for a wedding. Although the floral print would be fine unfortunately on closer inspection I found that the colour in the tassels print clashes slightly with the Cerise ‘linen’. 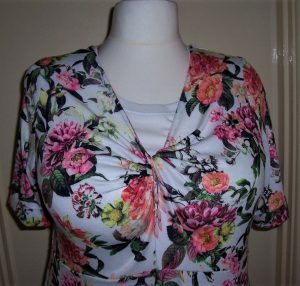 Finally, the ladies were unanimous in their selection of this fine jersey from CheapestFabricsUK who sell through eBay. I have to agree that this delicate print is fabulous. I only hope that I can do it justice. 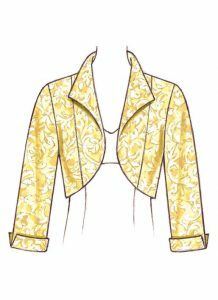 To take advantage of the great drape qualities, I may well opt to make the wrap front bodice- a hack of the Dartmouth top from Cashmerette. 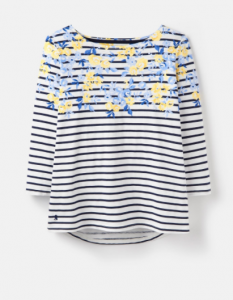 Other plans were inspired by a visit to the Joules store on board ship during my recent cruise holiday. I was particularly taken with these striped jersey tops. 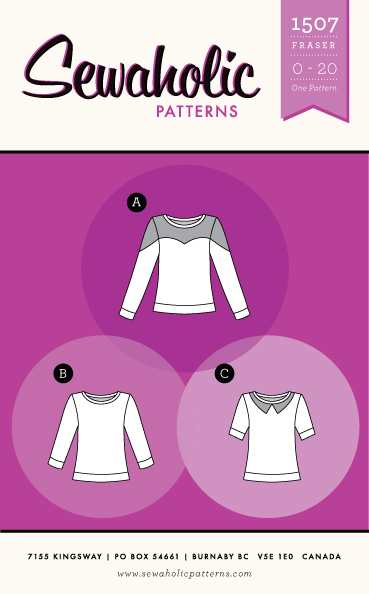 I could use the Fraser sweatshirt pattern from Sewaholic – or draft my own dividing lines for the different prints. 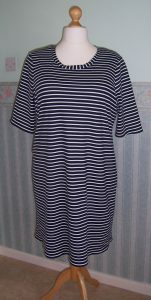 From an eBay seller I bought some lovely ponte roma in White with a narrow Navy stripe and plan to combine with some floral print as a yoke across the bodice and sleeves. 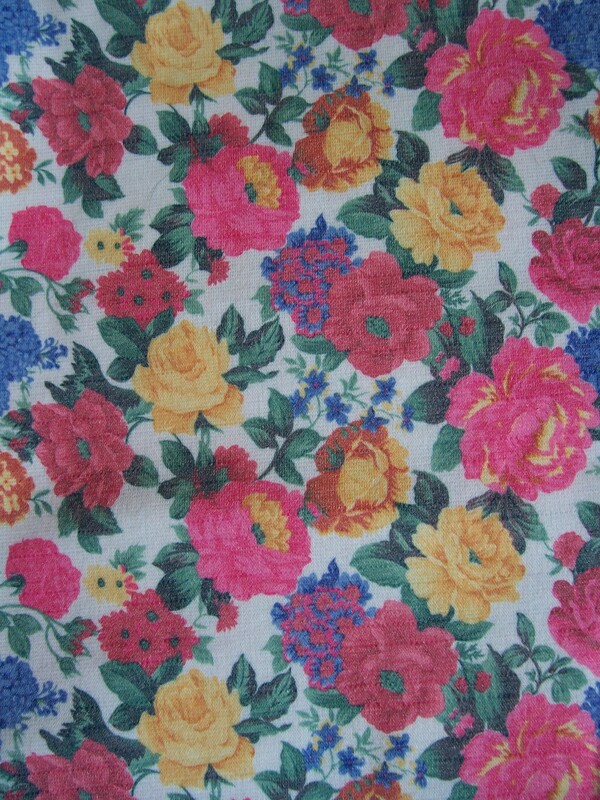 The floral ponte roma came from the CheapestFabricUK. 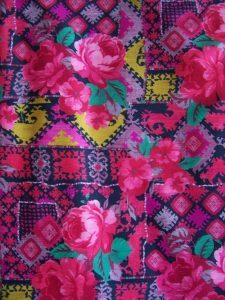 I also plan to re-fashion the Neenah shift dress (now too big) that I made with the Navy/White version of Ponte Roma and use some of this bold-coloured floral printed fabric (purchased from Minerva Crafts) for the yoke. So that is just 3 garments – possibly 4 that I plan to make in the near future. If I can just stop procrastinating and get on with sewing the outfit for the wedding then I can pursue the exciting projects that I have planned for the Summer. I will write and tell you of my progress and finished garments next month.